To recap, I chose to make the smaller, four block, two color quilt which finishes at 51" x 46". Purple was obviously going to be one of my colors. I opted for yellow and orange to be my second color, pulling lights and darks of each of these. In the end, I chose to set my blocks with like colors on the diagonal from each other instead of having the purple half all together. This was such a fun project. The quilt top went together very quickly and I love the giant size blocks. 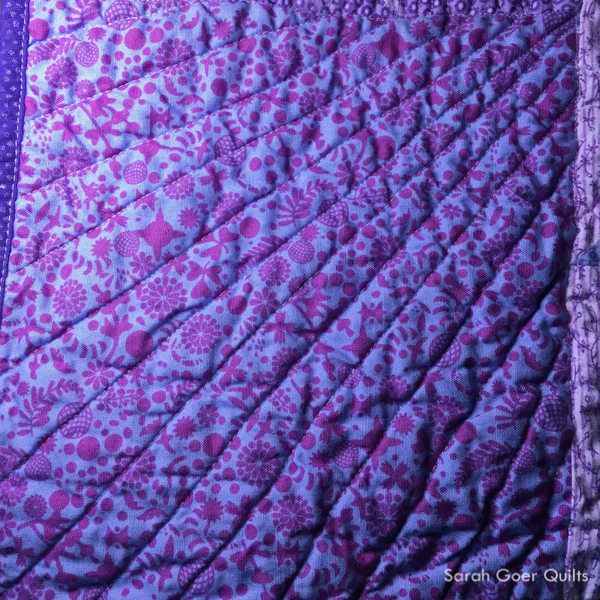 I opted to use a different free motion quilting motif (some more dense, some less dense) in each section. It's such a great way to test out or practice different motifs without committing to a larger area. Clearly, I like this strategy. My husband gave me Shape by Shape Free-Motion Quilting with Angela Walters for Hanukkah and I made excellent use of this new resource in finishing this quilt. How did I not own this book yet!? And more importantly, when am I getting Volume 2? I quilted each quadrant in a different color of 50wt Aurifil thread, Yellow (#2135), Light Lilac (#2510), Dark Violet (#2582), and Burnt Orange (#1133). Here are a few shots after it was washed and crinkly. 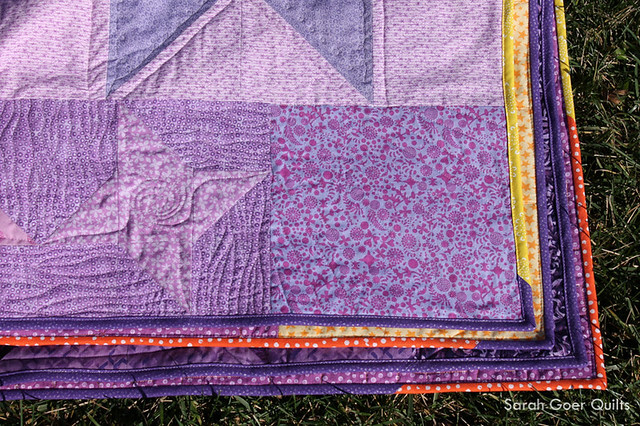 I backed the quilt with fabrics from my stash. In a "make it work" moment, I pieced two different prints that coordinated with the quilt top. 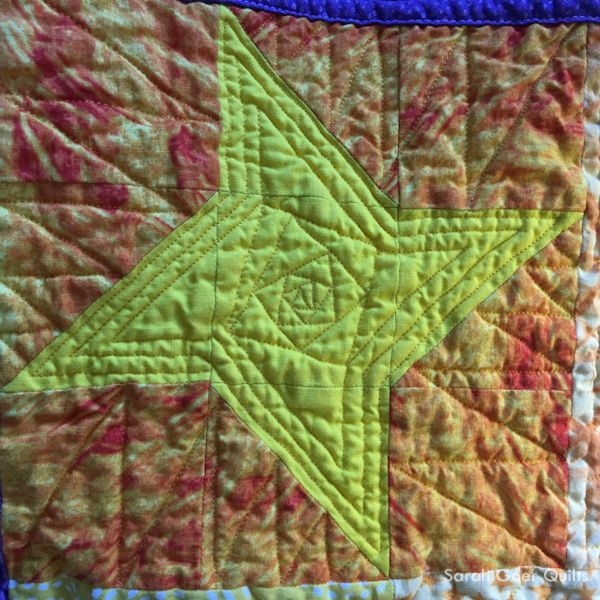 The orange star print also appears in the top surrounding the large yellow star. Overall, I love the bold color and especially the texture of the quilt. My favorite part may be the area around those little purple stars. I'll be using that FMQ again soon! I had some little helpers for my photo shoot. I don't usually have quilt holders, especially the wiggly variety, but we had fun. They really enjoyed running around the courtyard while I took all of the shots of the quilt on the ground. Thank you for visiting! I'm linking up to Needle and Thread Thursday, Finish It Up Friday and TGIFF. Six more days until issue one of my newsletter (packed with color and design ideas!) will be in your inbox. If you're not already a subscriber to my blog, you can subscribe here for creative inspiration and blog updates. Posted in Quilting. 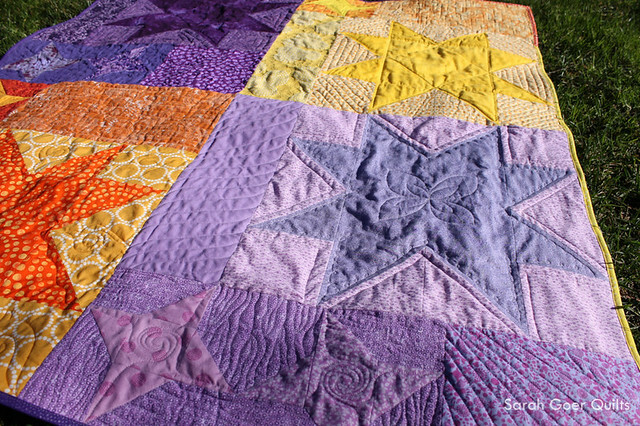 Tags: finished quilt, lap quilt, quilt along, Star Light Star Dark on January 19, 2017 by sarah. I love the yellow and orange with the purple. Hopefully you don't have to wait until next Hanukkah to get volume 2! Yay! Sarah, great finish! I hope to get back to work on mine soon! Thank you, Paige. I look forward to seeing yours! 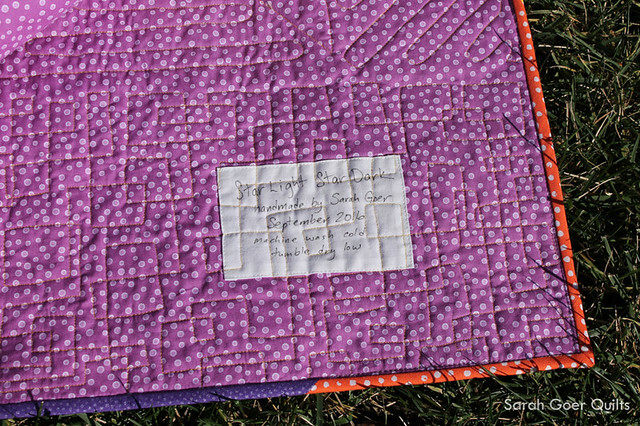 It sounds like the delay on finishing the quilting worked out perfectly and what a great gift from your husband. Your quilt holders look like professionals! That's a lot of extra binding and with as much purple as I assume is in it, I hope it will go to good use soon. Congratulations on the great finish! Thank you, Yvonne. That's a great way to think of it! 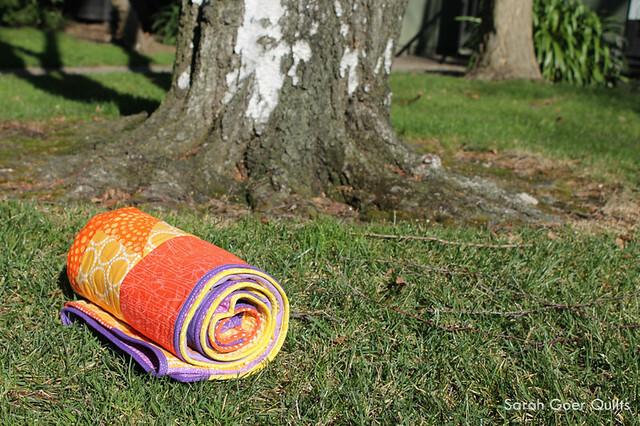 The perfect project was waiting for the perfect FMQ inspiration! It's the scrappiness of the extra binding that concerns me. I do use a lot of purple, but not as much purple with yellow and orange. ;-) I may be chopping that binding up to use it. Time will tell. 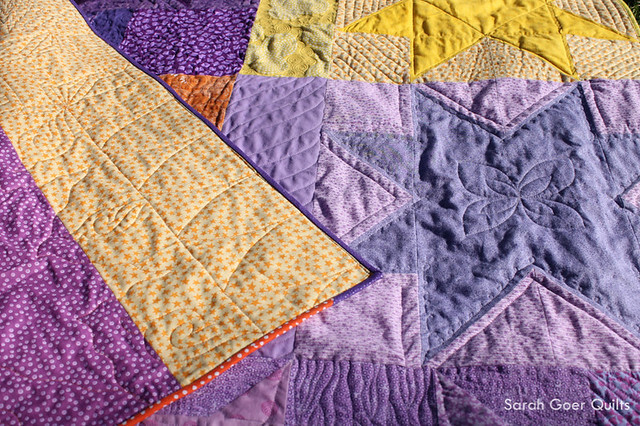 I love your color choices, and the mixed quilting looks cool. Thank you, Jess! 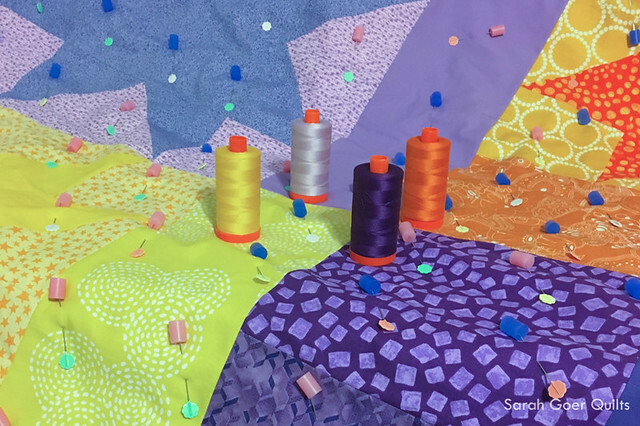 A project like this always fires me up for more free motion quilting. Sarah this turned out great! It is so beautiful. I just got the Shape by Shape book for Christmas, it has so many great ideas for sure. I look forward to your newsletter. Thank you, Elizabeth. 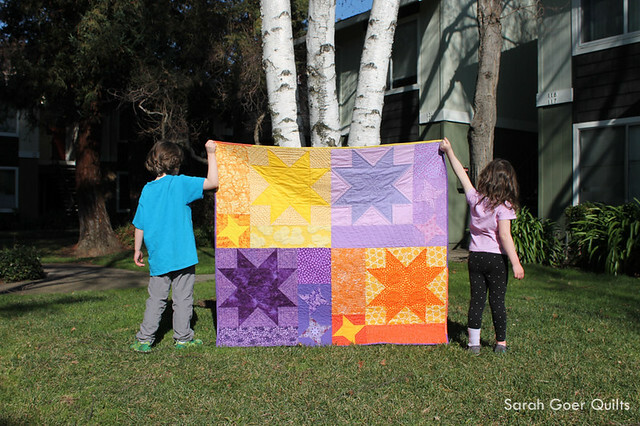 It was so fun to see everyone's SLSD quilts. It's nice to have mine finished. Enjoy the Shape by Shape book. It's great stuff! Visiting from crazy mum quilts. What a fabulous quilt! I love that pattern. Thank you, Malgorzata. If you haven't seen it, this post at Quilty Habit shows many of the quilts from people who participated in the quilt along. So many beautiful versions of the pattern! That is beautiful! And bravo for the diverse quilting! I love Angela's books! What a fun finish. You sure seem to be having fun experimenting with different FMQing designs and they add such interest to your tops! Thank you, Mel. You are an inspiration in the FMQ department. Often I just want to be done when I get to the quilting step. I think it's important for me to practice my FMQ on these smaller projects so it doesn't feel so daunting when I get to something larger. This is an awesome finish! It may have taken you longer than you wanted, but it was worth the wait. Great idea to try different quilting motifs in each block. Now I'm regretting that I didn't have time to play along with this QAL. That pic with your kids is phenomenal! I love it so much! Your FMQ is the star here (no pun intended). Volume 2 is just as great, by the way. I'm in awe of your finished product! Aww, thank you so much! I sent it off right after finishing it. I miss it already. ;-) The pattern is so scrap friendly! I may have to make another one some day! You did a great job. Congratulations on the finish and thank you for all the details. I like to hear and see the process that others quilters use. Don't worry about that binding. I am sure it will turn out to be an unexpected blessing down the road somewhere! I was in the middle of moving, buying and selling a house during this QAL, so I didn't get to enjoy the process personally. I have enjoyed seeing the others. Thank you, Pam. It is always fun to participate with a group for a QAL and see how each person's palette and fabric choices develop. I love that the quilting community is rich with opportunities on blogs and Instagram. 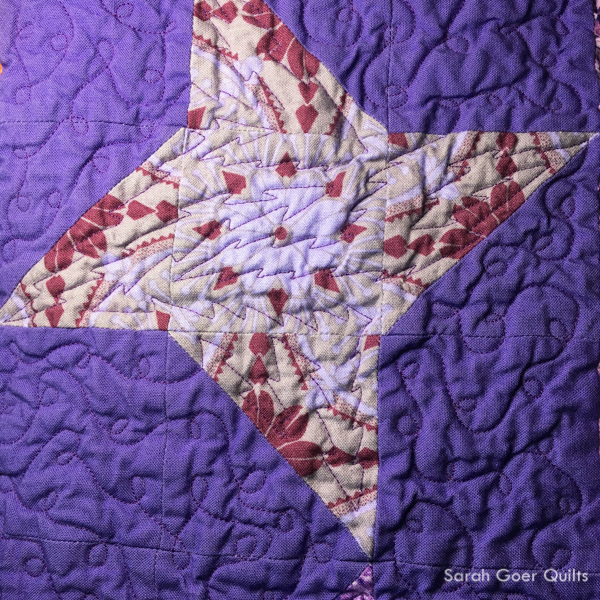 Sarah, I agree with the other commenters that your FMQ adds so much interest to this quilt. 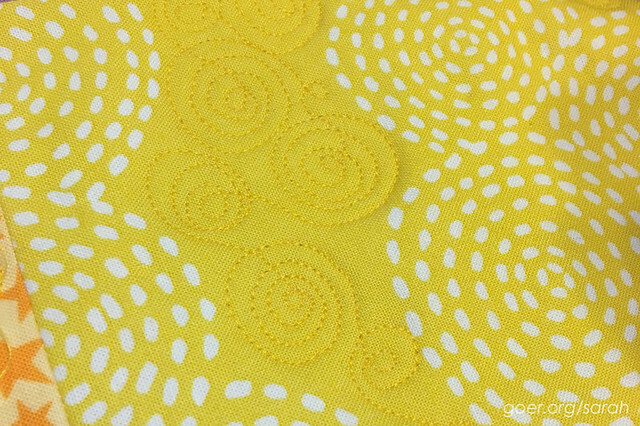 I've only experimented minimally with FMQ, but your post makes me want to make it more of a priority. But it seems so time consuming. 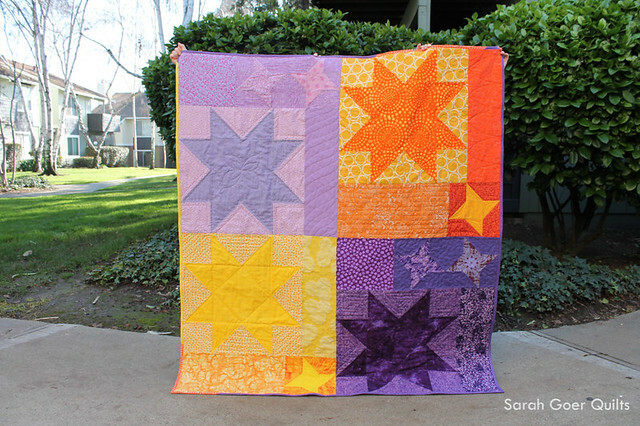 Do you have any idea how long you spent FMQing this lovely star quilt?